False. He was the beneficiary of the best cycling team for a long period of time in addition to being very very good. Everyone in the world wants to take this guy down, if he was cheating we would have proof by now. I think he's just fairly singleminded and of the same talent level as guys like Miguel Indurain and Greg Lemond and his team was just awesome. Last edited by Electromatic on Tue Jul 06, 2010 3:18 pm, edited 1 time in total. And Goldman Sachs is just really good at trading. aren't they? He hasn't gotten better with age. He has tailed off as he got older. I guess it's a little naive to think anyone in any endurance sport hasn't at least used blood doping or something similar at some point but that would negate the "cheating" aspect as well if everyone is indeed "doing it" at that level. Is Goldman Sachs doing anything any other major firm isn't trying to do? My point is unlike the majority of the clear dopers Armstrong never really blew away the field out of nowhere. He was always near the top and he won quite a bit becuase his team did the bulk of the hard work in the mountains, then when he had the opportunity to make time he did. The last guy that got his title taken away was so much better than everyone on that particular stage he obviously was doping. The fact that Armstrong won 7 is an incredible amount but he was at least among the best in the world that whole time and it fell his way. So many people hate him now there would be a lot more clear evidence. He at least has not gotten better with age, after the 7th when he retired he wouldn't have won the next year...and Contidore was a lot better last year. Armstrong didn't have what he once did in the mountains. The Wall Street Journal has published a fascinating piece about Floyd Landis’s allegations of widespread doping in professional bike racing. Predictably, Lance Armstrong dismissed the allegations, saying he is too busy to address the specific claims and attacking Landis’s credibility. I’ve never studied lying versus truth-telling academically, but I have thought a lot about creativity. And one thing that I have come to believe is that people – virtually all people, including me – are really bad at coming up with new ideas and insights. That is why I find the Floyd Landis allegations so compelling. He describes in great specificity and detail scenarios involving refrigerators hidden in closets, and the precise temperature at which the blood stored in those refrigerators had to be kept; and faked bus breakdowns during which Lance received blood transfusions while lying on the floor of the bus, etc. To make up stories of this kind, with that sort of detail, strikes me as a difficult task. If indeed the stories Landis tells are not true, my guess would be that these incidents actually happened, just with a different set of players, and then Landis switched the names. Further convincing me that there is likely to be truth to what Landis says are personal conversations I have had with a former Tour de France champion. He also spoke with great specificity and a clear understanding of the physiology and science of biking and doping. 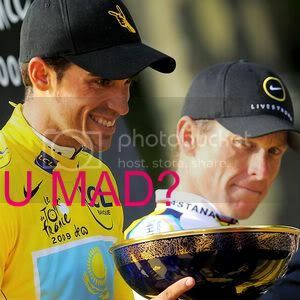 He was completely convincing to me, and indeed after talking to him I gathered a bunch of data from the Tour de France. An undergraduate working for me found suggestive, but not completely persuasive, statistical evidence of doping in the Tour de France. One of my graduate students is now studying the issue. More surprising to me than the allegations is the fact that people seem so willing and eager to believe that Lance Armstrong is not doping. The evidence suggests that the benefits of doping in bike racing are perhaps greater than in any other sport except weight-lifting. In contrast to sports like baseball, where it is hard to find obvious links between steroids and performance, when racers/racing teams are caught doping and confess the details of when they started, the improvement in their times is stark. When the benefits of cheating are so great, it is statistically unlikely that anyone could race at the top without cheating. So many of the top racers have been caught. And it is not like Lance looks particularly clean. An Italian doctor who he worked with, Dr. Ferrari, went on trial for doping-related charges. Interestingly, Armstrong denied any ties to Ferrari until he was caught on a hidden camera exiting Ferrari’s office building, or so I am told. The single best idea I’ve heard with respect to doping comes from Aaron Zelinsky, who argues that the blood and urine of current competitors should be kept around for decades and systematically tested as new technologies are developed. If anything illegal is ever detected, the cheating is then publicly revealed. Indeed, in a shadowy and perhaps illegal way, that basic approach led to an alleged positive EPO test for Armstrong, when a French newspaper reported that old urine samples from an earlier period (before a test for EPO existed) tested positive for the substance on the new test. Maybe the answer is simpler still…just let the racers dope freely, as Dubner argued on the blog a few years back. Honestly it's so prevalent in cycling why not see what doping can do when it's not sanctioned? Bring on the East German womens swim team. I thought those guys were more into shark adrenaline and stuff. i think his one nut gives him an unfair advantage. Nice article by Rick Reilly on this very subject. one of my favorite sports photos. I'm confused. Was that written by his publicist, or his agent? The funny thing is that he struggles when it's come to run a marathon. The dude was to confident about his genetic gifts and forgot proper running technique that a kid knows. I think he took the wrong stuff today. you should send that to Rick Reilly. DALLAS—Saying that it would probably be best if everyone sat down for this, seven-time Tour de France winner Lance Armstrong informed the U.S. populace Thursday that he wanted to tell it something, but that the nation first had to promise it wouldn't get angry once he did. "Look, I'm not going to sugarcoat this. It's bad," Armstrong said during the nationally televised press conference. "But you have to swear to God that you won't get mad when I tell you, because if you get upset and yell about how you're really disappointed I'm just going to walk out of here." "Okay?" Armstrong continued. "You guys promise?" Armstrong then took a deep breath, massaged his forehead, murmured "Oh boy, here we go," and appeared for several moments to be on the verge of telling the nation his news. He seemed to lose his focus, however, commenting that it wasn't as if anything he was about to say would diminish the fact that he beat cancer or that his foundation has donated more than $250 million to cancer research. In addition, Armstrong said the American people had to promise that, following his announcement, they would resist the urge to remove their Livestrong bracelets and throw them away or burn them. "Okay, there's no easy way to put this, but, well, you guys know how I won a record seven consecutive Tours de France between 1999 and 2005?" said Armstrong, who took a sip of water as his hand visibly shook. "Well, this has to do with that. It also has to do with this impending federal investigation of my cycling team. What it absolutely does not have anything to do with is the fact that I am an inspiration to cancer sufferers worldwide—cancer sufferers who could potentially experience serious physical and emotional setbacks if you break your promise and get mad at me." Throughout the preamble to his announcement, onlookers reported getting the impression that Armstrong felt some need to defend what he was about to tell the country. The world's most successful cyclist spent almost 25 minutes telling the nation that, as a top-level international athlete, one has to do certain things to remain competitive; that he has no regrets; and that, given the chance to live his life again, he would do everything again the same way. Armstrong also repeatedly mentioned that he had beaten cancer. "You have to understand—in the high-pressure world of competitive cycling, it's all about getting any advantage you can," Armstrong said. "And if we were being realistic, we'd have to admit that everyone in cycling was trying to get an advantage. So, in a way, if we were all trying to get the same advantage, then the playing field was still completely equal. So I was still the best. It makes sense when you look at it that way. And nothing I am about to tell you changes that. So, when I'm finished saying what I have to say, you all have to promise to still adore me." "In fact, if you don't still adore me, and you suddenly get all huffy and say that I wasn't really a hero all these years, you are in the wrong here, not me," Armstrong added. "You. Not me." Armstrong then stood, paced back and forth for a moment, shook his head, and returned to the microphone. "You guys are not making this easy for me, that's for damn sure," he said. "This really shouldn't be hard. Because it's actually not even really that big of a deal. At all. Frankly, I don't even know why I'm here right now." Armstrong reiterated for a fifth and sixth time that he had beaten cancer. "Okay, here goes," Armstrong said. "Um, in the late '90s and early 2000s, I took, um… You see, in order to give myself a better chance of winning, I… Yes, there were instances during the Tour when…"
"You know what? I forgot what I was going to say," Armstrong added. "Sorry. I feel like an idiot. Have a nice afternoon."